At once intense and delicate, it deploys vanilla, butterscotch, all in a woody atmosphere that is reminiscent of bourbon. With a little water, softer. Spicy, it seems to me a little unbalanced. Even with a little water, the balance leans too much on the side of spices. Some bitter tannins, this final is impressive but a bit steep. Floral, grass, spices. Hay. Apple. Violet. Rhubarb. Light caramel. Light dust. On the palate it's a little more fruity. Woody a little green. Always rhubarb. A little citrus. The grass and the floral spring in the back of the mouth. Long finish on the sweetness of yellow fruits, cane juice, grass. Odd that it states it is a 1973 vintage, bottled in 2012, yet 35 years old - unless it was taken out of the barrel in 2008/9 and stored in a neutral container? Or is the "over 35 years" a non-specific labelling, and this is actually 38/39 years old? Nose: we’re really walking in the forest after a heavy autumnal rain. Moss, fern, mushrooms, damp earth, wild flowers (foxgloves? Never mind…) and then these metallic notes that work so well, sometimes. Around grandpa’s old toolbox… Very different and very beautiful so far. With water: it gets even more different. More old tools, a pot of old rusty nails, gooseberries, cured ham, sparkling mineral water and just whiffs of lilies (not as heady as lilies). Mouth (neat): superb! It’s very much alike the 1970 (ie : Mosstowie 28 yo 1970/1998, 59.6%, Cadenhead, Chairman's Stock, bourbon barrel, 198 bottles; SGP:471 - 85 points), only smoother, almost silky despite the power. 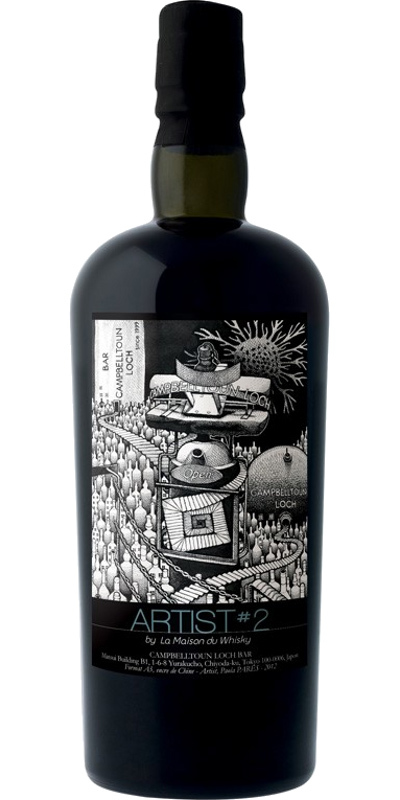 Yellow chartreuse, figs, cough medicine, rose water, beeswax… In fact it’s very tertiary. Ah well… With water: maybe not the best swimmer ever, becomes a little disjointed and watery (even at +/-45% vol.) but who needs water! Finish: medium long, fresher. Pistachio ice cream, cinnamon and touches of fresh coriander and sorrel. Comments: lovely and very unusual (which is lovely as such). It’s got something of some very old Irish, in a way. These notes of LMDW perfectly reflect the impression left by this single malt during its discovery at Whisky Live in Paris 2012. Thank you Jean-Marc! The nose is rich, original. Each note of the aromatic palette is at its peak and at no time does one feel any sag. This Mosstowie is at the same time deeply rooted in the ground and of a magnificent pureness.Spring and floral to wish it evokes a cornucopia. Its fruits are juicy and exotic (ripe banana). A magnificent note of star anise comes to crown the whole.The empty glass exudes pleasant notes of barba-papa. It does not give in to the nose, the mouth adds an extra soul.Spiritual, it diffuses notes of incense, leather and wax. Generous, it offers ripe fruit, noble spices and heady flowers. With a lot of purity, it goes to the essential balance, freshness, precision, elegance are a few words dropped. Long, tender. With ever so much delicacy and herbaceous originality, its aquatic tones (water lily) are a perpetual source of enchantment. The natural class of this version bursts into the open. 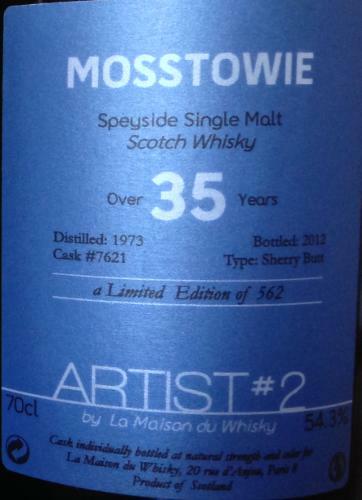 Comments from LMDW: From 1964 to 1981, the Miltonduff distillery produced a second single malt called Mosstowie, rarely bottled. This 1973 has something to raise the passions and give birth to vocations as its exotic fruity, aniseed freshness and generous mouth are in tune.